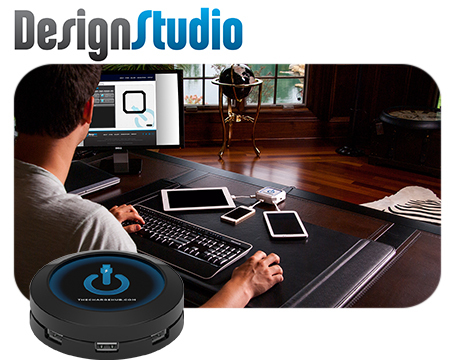 Use our custom DesignStudio to personalize your ChargeHub™ for FREE with your own photo, logo or artwork! With just a few clicks of the mouse, you can quickly and easily personalize your ChargeHub™ to complement your home or office décor. At home or on the road, use the top of your ChargeHub™ like a picture frame to showcase your favorite photo on your night stand, living room or office. Crop and adjust the picture as desired. Print picture and cut it out to fit your ChargeHub™. Note: Photo paper is recommended for better quality printing. *For bulk orders, please contact your local promotional product distributor, or visit www.limitlesspromos.com. Enter a name for your design. It will automatically be saved. To change the shape of your ChargeHub™, Click on "Change Shape or Color" and select the shape or color you wish to design with. This will help you visualize your design before printing. To add a photo, graphic or other image, click "ADD A PHOTO" and follow the instructions. To add text, click "ADD TEXT"
All your photos and text will show up as individual layers. You can click and drag the layers to re-order them. To select a layer, just click on it. Click the "PRINT" button to download and print the generated PDF of your design. Click and drag on image to select drop area. All Rights Reserved | All Logo Copyrights And Trademarks Are Property Of Their Respective Owners.